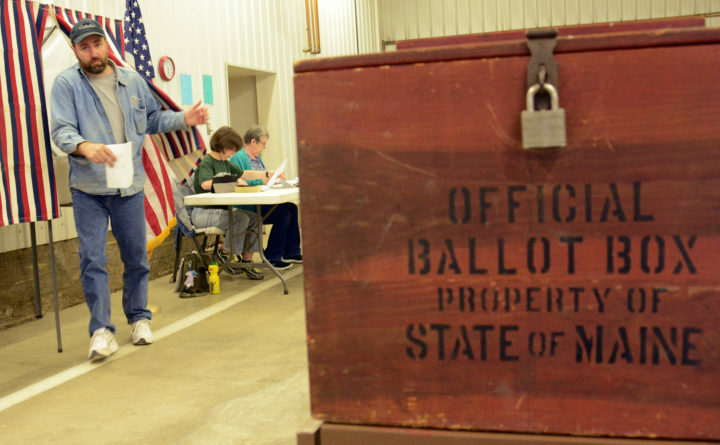 A Maine resident casts a ballot during a 2016 referendum vote. In 1909, Maine amended its Constitution to create a process for citizen-initiated legislation. More than a century later, legislators have an opportunity and responsibility to reassess that important process to make sure it fairly represents voters across the state while clearly and accurately providing them with information needed to cast an informed vote. The citizen initiative process enshrines a critical avenue for voter empowerment, and as such should be protected. But in order to maintain its integrity across the state, Maine people must have trust that the process truly advances their collective interest and allows them to be informed participants. There is no doubt that more and more major policy battles are being fought at the ballot box rather than in the Legislature. In the first 80 years that citizen initiatives were allowed on the ballot, there were 30 referendum questions. In the last 25 years, there have been 46. The increase in initiatives is in part due to a strategy push from advocacy groups both within the state and around the country. Outside groups in particular can use Maine’s initiative process and relatively cheap media market as a vehicle to try out and eventually advance ideas around the country. That’s not necessarily good for Maine. The Legislature itself also bears responsibility for this spike by failing to act on some key issues facing our state. But no matter the cause, the resulting flurry of initiatives — including questions about the fiscal details or even the constitutionality of individual measures — can prove a problematic way of making law. Take, for example, the five non-bond ballot questions from 2016 on marijuana legalization, an income tax surcharge to fund education, firearm background checks, a minimum wage increase and ranked-choice voting. All but the background check referendum passed, but the debate and the work didn’t stop there. Legislators spent a great deal of time re-writing, rolling back and even repealing those initiatives — partially due political pressure, but also because of the complexity of the issues at hand. Citizen-led legislation is an important safety valve to get around legislative inaction. But it shouldn’t be used in an attempt to address complicated issues through overly-simplistic, incomplete and sometimes unconstitutional ballot questions. Several different approaches to referendum reform have been floated in recent years, and have come back to Augusta this session in various Republican-sponsored bills. One tact is to promote increased awareness and analysis at the front end of the process, particularly related to the potential cost of these proposals. Republican Rep. Josh Morris of Turner has introduced a bill that would require ballot initiatives to include a fiscal estimate from the Office of Fiscal and Program Review. That bill is scheduled for a Feb. 13 hearing before the Committee on Veterans and Legal Affairs. Right now, voters are often asked to make referendum decisions that carry significant financial implications without a complete picture of how to pay for them. It should not have taken the long legal battle surrounding ranked-choice voting to prove that citizen initiatives should pass constitutional muster before they are put to the voters. If that wasn’t clear before, it’s exceedingly apparent now. Another common criticism relates to the signature gathering process for these initiatives, which require signatures from 10 percent of the number of voters from the previous gubernatorial election. Signature gatherers can currently focus on the Portland area and other larger population centers to collect the required signatures, which causes some frustration in more rural areas. According to the National Conference of State Legislatures, of the 24 states that have a citizens initiative process, half of them use some sort of geographic distribution requirement. Maine should join them. These geographic requirements can help ensure that large population centers don’t overwhelm rural areas in the process. “If we are going to have a referendum system, we need to make sure that it’s a platform for Maine voters to enact change, not a system that pits the northern and southern parts of our state against each other,” said Sen. Brad Farrin, R-Norridgewock, in a recent statement. Multiple signature bills have been introduced, including one from Farrin that would require an initiative to get signatures from 10 percent of gubernatorial voters in each of Maine’s two congressional districts. Another from Rep. Trey Stewart, R-Presque Isle, would require 10 percent from each state Senate district. Farrin’s may be more workable, but the general idea behind both is worth exploring. It’s important to remember that Republicans have tried and failed to use the referendum process as successfully as their counterparts on the left. When considering referendum reform bills, the Legislature must take care to separate real reform that can rein in and improve the process from more cynical attempts that might slow it to a halt. We don’t need to take a hammer to our referendum process. But some legislative, and yes, constitutional, changes will ensure that all Maine people have a voice and the necessary information to fully engage in it.